The Satu'li Canteen is located in the new Pandora/Avatar section of Animal Kingdom. 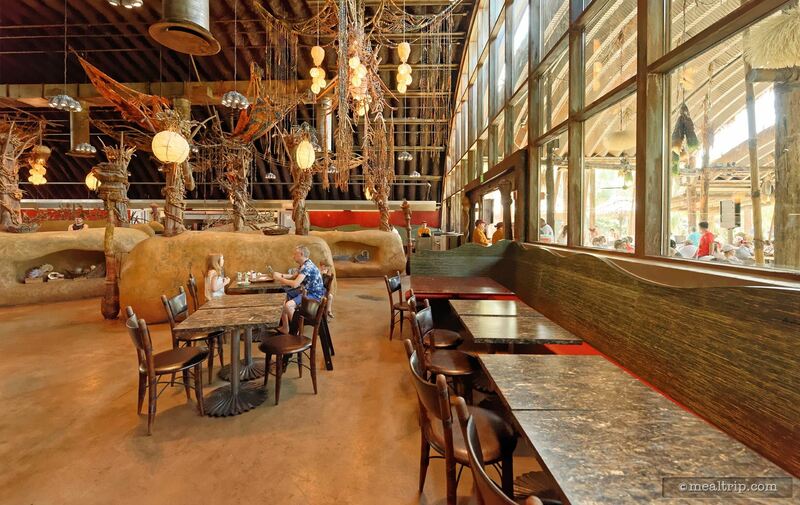 There is indoor and covered outdoor seating available. Satu'li is making use of melamine plates (plastic) that have an earthen-natural shape and color, along with real metal flatware. The silverware and beverage dispensers are located along one side wall, opposite the food ordering area. 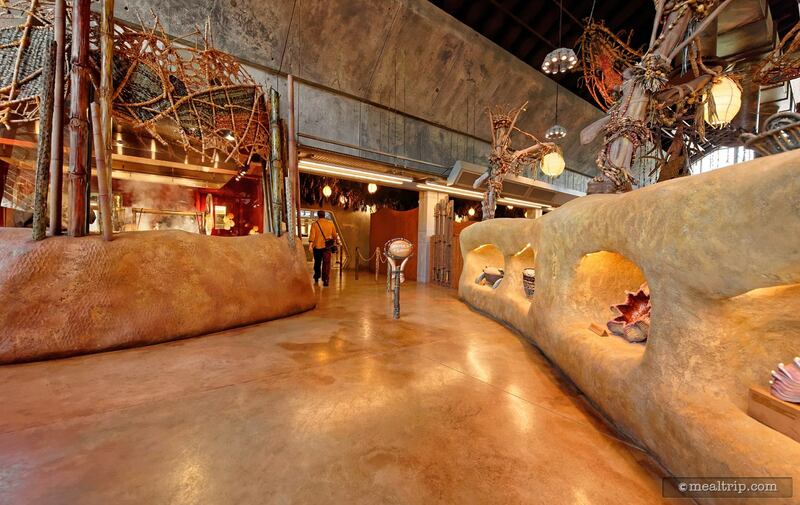 The all-day menu for this counter service "mess hall style" dining area in the new Pandoraland is shaping up to be mostly American cuisine with slightly modern embellishments thrown in here and there (most of which appear to be borrowed from various Asian cuisine). 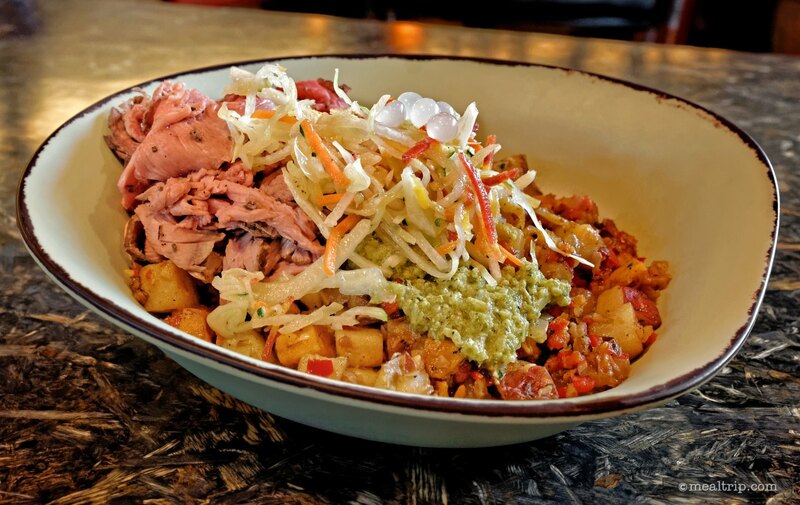 The "build your own bowl" concept plays large on the menu, where guests can select one protein, one base-side, and one topping from a list of several options. 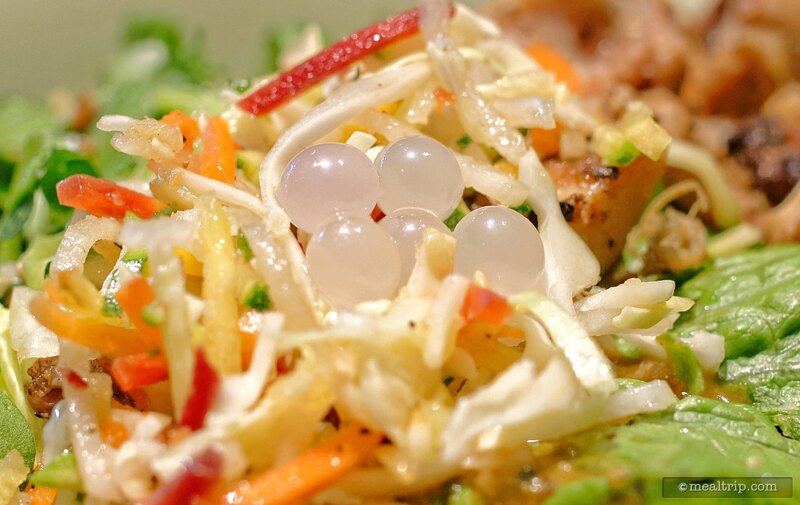 Garnishes like slaw and bobba pearls are served with each dish. Specialty beverages will also be available along with a couple of dessert items. On my first visit I ordered the Slow-Roasted Sliced Beef as the primary protein in a "build your own bowl" entree and found it to be a bit undercooked, cut incorrectly so that it ended up being slightly tough, and a fairly small portion size for the price being charged. This time around, I gave the Chopped Wood-Grilled Chicken Bowl a try. 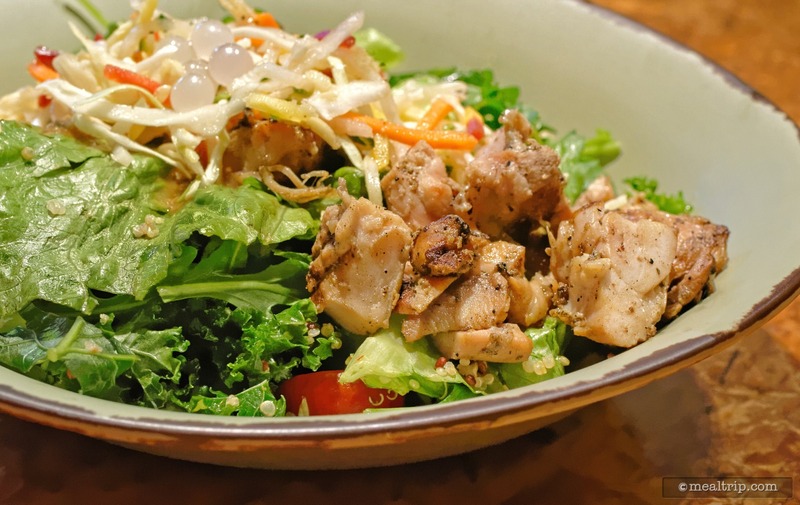 This one is said to combine "Wood-Grilled Chicken Thighs marinated with Garlic and Olive Oil" along with a base which was the "Quinoa & Vegetable Salad" and a sauce, the "Black Bean Vinaigrette". All in all, I did like it better than the sliced beef bowl. Although the amount of chicken seemed to be about the same (volume-wise) as the beef, it was a $1.49 less than the beef bowl, so the price seemed a bit more in-line with the current state of Disney counter service pricing. The wood-grilled flavor was present as was the garlic. A few of the precut chicken pieces were crazy high salted, to the point were it was a bit uncomfortable to have in your mouth… but the other 90% of the chicken was appropriately seasoned. The Quinoa & Vegetable Salad which was sitting under the chicken seemed a bit light in the Quinoa department, but again, was a good mix and balanced well against the chicken. The Black Bean Vinaigrette to me, seems to borrow from Asian cuisine (think soy sauce) and probably combines garlic, ginger, shallots, rice vinegar, soy, and fermented black beans. The sauce will have a tendency to ramp up any sodium level issue in the other components… so this felt like one salt-heavy mix, even though it was probably the combination and quality of garlic, rice vinegar, and chili sauce. To summarize, I would order this one over the Beef Bowl. To close the meal out, I finally got to sample the second dessert on the menu… which would be the "Chocolate Cake" (you would think they could have come up with a more Pandoran name there). The Chocolate Cake is said to include a Crunchy Cookie Layer and Banana Cream Topping. As a whole, it has some "dark chocolate-like" qualities that feel more like unsweet bakers chocolate, and not actual "dark" chocolate. The Banana Cream was not pronounced enough to taste, but the Crunchy Cookie Layer at the bottom was kind of cool. It has a course sugar type of mouth feel that give the dessert a nice texture component against the very smooth cake. There were a few, very small, cut mango cubes in the bowl and couple of red Goji Berries on top of the dessert. If you've never had Goji Berries… this isn't a good way to find out what they are. These could have been pimientos for what little flavor they had. 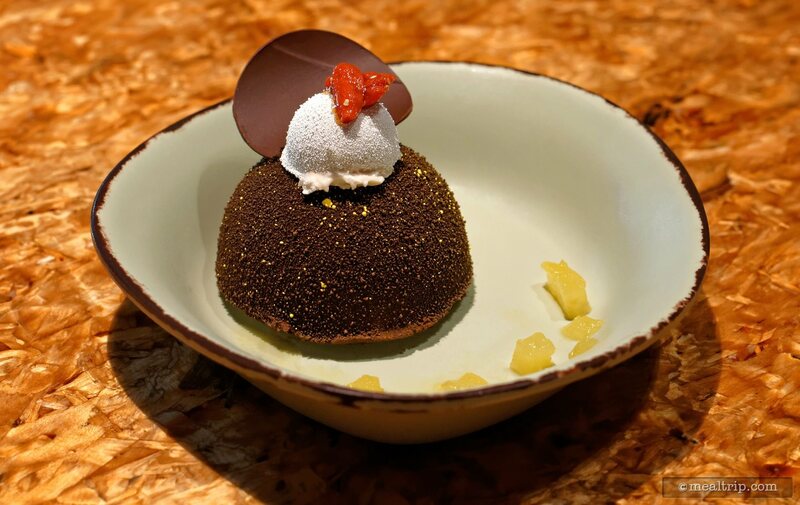 Five or six even smaller sesame seeds top the Goji Berries, and there was a shaved chocolate circular disc as a garnish as well. It's a very, very pretty dessert. I think the Chocolate Mousse Cake at Epcot's Sunshine Seasons is still my favorite. 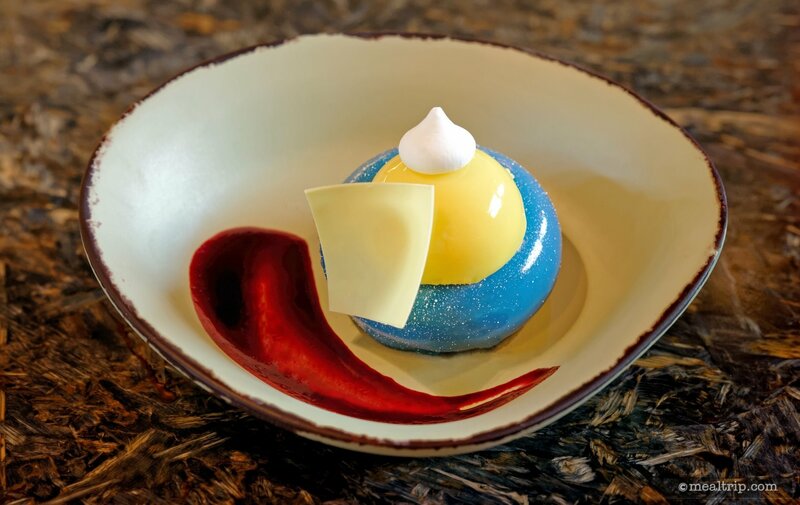 If I had to choose between Satuli's Blueberry Cream Cheese Mousse or the Chocolate Cake… meh… honestly, they're about the same. Neither really seem to be flavor-forward enough for me to call either one a "must try" item. 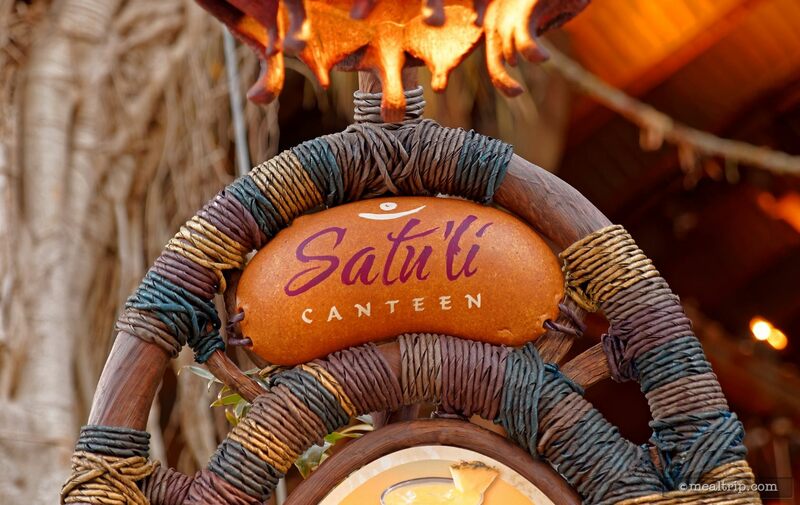 Satu'li has different food and flavors than you can find anywhere else. It's a great counter service location that should be visited at least once. 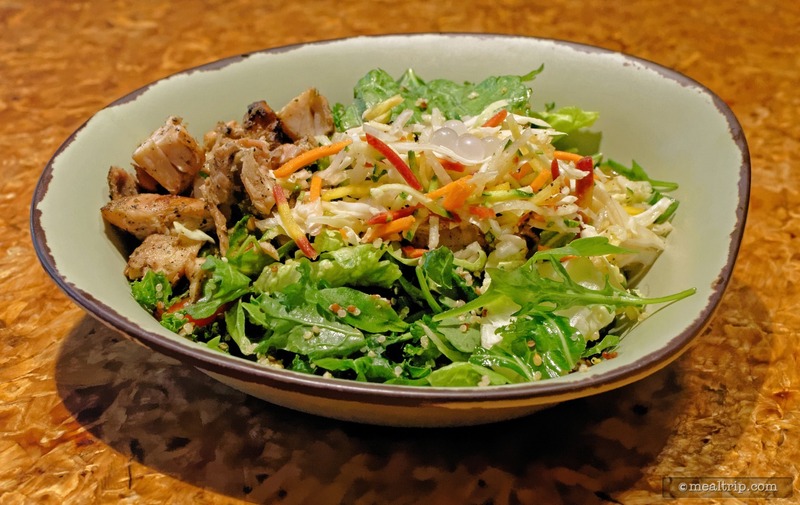 The idea of Satu'li featuring "healthful dishes with wholesome grains, fresh vegetables and hearty proteins holds true. I just don't feel like I have found those one or two "wow" items with high craveability yet. 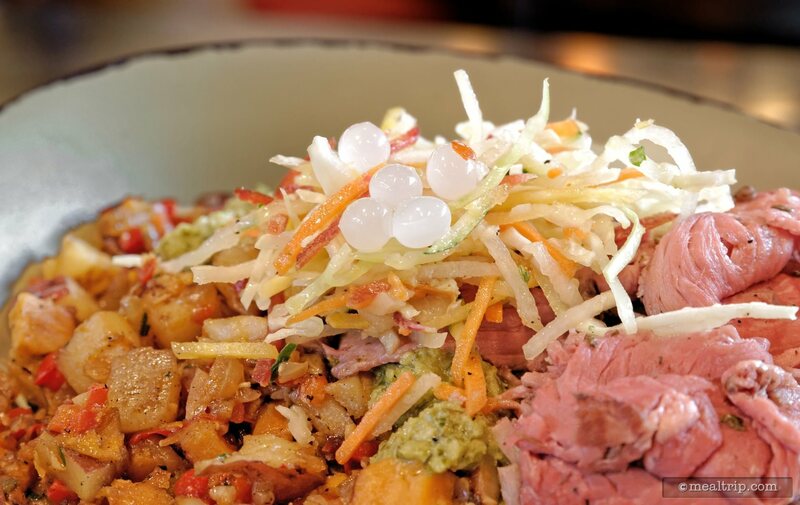 The Satu'li Canteen is the new counter service location in Animal Kingdom's Pandora. It's a fairly large location with maybe 60% indoor air-conditioned seating and 40% outdoor (but fully covered) tables to choose from. 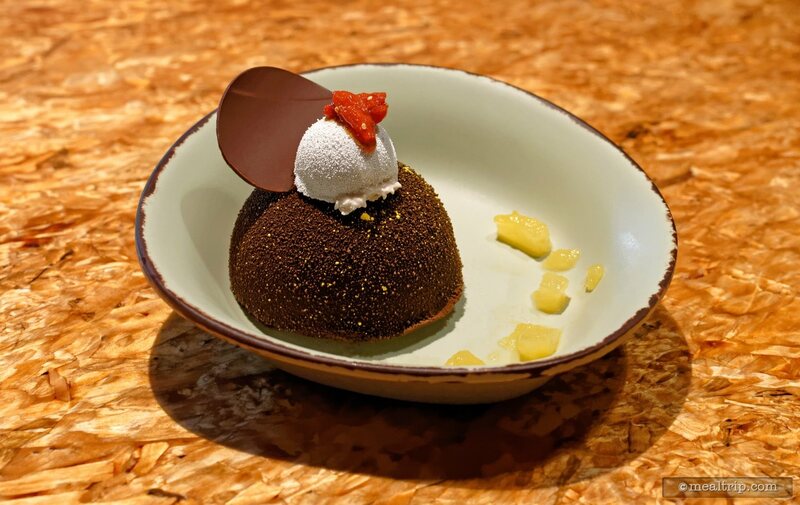 While the menu (at first glance) may look large and exotic, this is mostly American cuisine with a few nods to Asian food tossed in here and there, and… there's "really" only two things on the menu, "stuff in puffy bread", and a "build-your-own bowl" option. The format here is very similar to other Disney counter service set ups… there's a large ordering cue, where you pay and pickup your food. There's two pieces of good news here… they seem to have found a system that works better for dealing with large volumes of guests, and you don't have to go to multiple windows to get different things. If you're familiar with Cosmic Ray's at the Magic Kingdom there are different things to eat, at different windows. If you want a thing from each window, it's going to mean a lot of line-standing which is hard when you have a family holding a table, wondering where the heck you are. We see a similar setup at Animal Kingdom's own "Harambe Market". 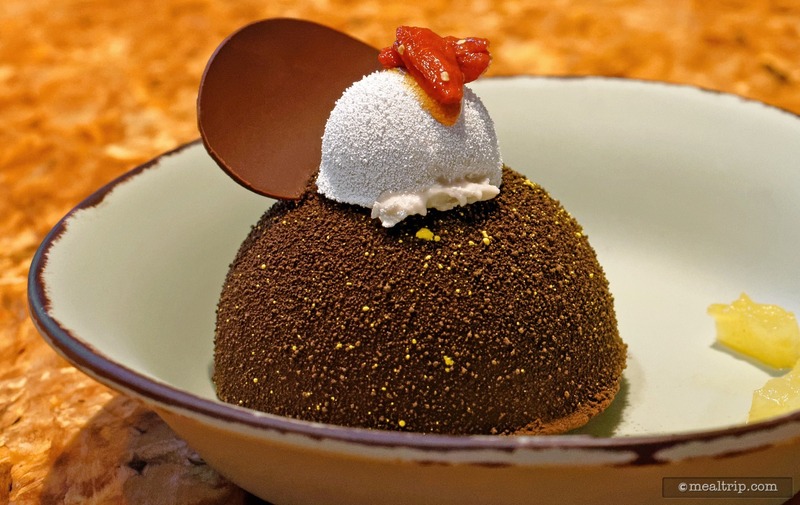 The other issue I mentioned about "large volumes of guests"… if you've been to the Magic Kingdom's Pinocchio Village Haus or Pecos Bill's at a peak dining time, you know that it can get a little crazy. There are multiple lines behind multiple registers. It's a design and space issue to be sure, some of these locations were created 40 years ago when there were less people on the planet. At Satu'li Canteen, they've built in enough room for a proper, single, large line… with metal guide rails and chains and whatnot. It's very much like an actual attraction line. 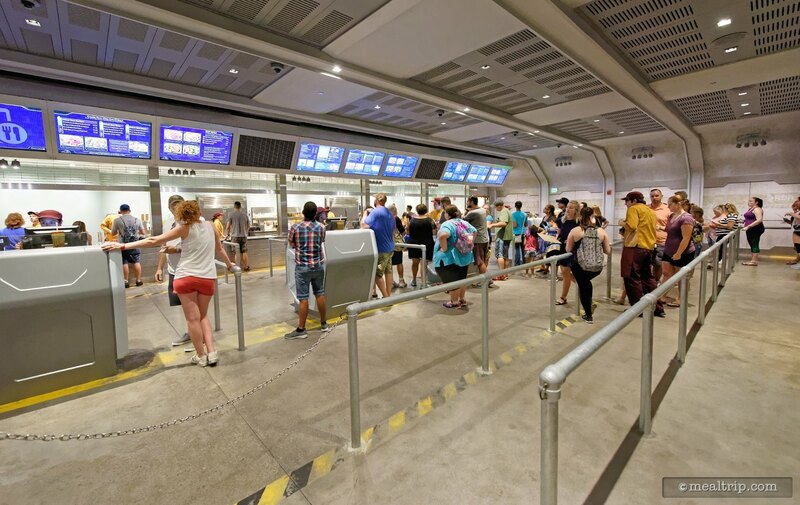 At the end of the line, there's a single cast member that will direct you to which register number you should cue up behind, to place your order and pick up your food. It's a small thing, but it makes the process much easier for everyone. After you pick up your food, it's off to the self-serve beverage and silverware station. Yes, real, actual, metal flatware which pairs well with the melamine (plastic) plates and bowls that all the food is served on! It is a really nice bonus for a counter service location to offer these things. It makes it easy to forget that it is still "quick service / counter service". At any other theme park, this would be a cheeseburger and hotdog stand… here, you start to think you're at an honest to goodness restaurant. As I mentioned at the top, if you carefully digest the menu, there really aren't too many variations here (which makes things go faster in the kitchen as well). On my inaugural visit to the new location, I decided to go with one of the "build your own bowl" options. The BYOB concept is not one of my favorite, you'll get a couple of unique bites, but before long everything sort of starts to taste them same... because it all gets mixed together very quickly in that single bowl. Basically you get to pick one main protein (in Satu'li's case that would be chicken, beef, white fish of the day, or tofu), one "base" (or what goes under the protein), which would be either quinoa & vegetables, red & sweet potato hash, mixed rice, or romaine & kale… and then one sauce (onion chimichurri, black bean vinaigrette, or a creamy herb dressing). Presumably, everything goes with everything else, to make a total of 48 possible combinations… that… well… probably all taste about the same. I opted for the Slow Roasted Sliced Grilled Beef with Red & Sweet Potato Hash and Charred Onion Chimichurri Sauce. There were great flavors here, there's no denying that. I really enjoyed the dish more, and longer than I thought I would. The potato hash made a great dense base for the potent (almost unnecessarily potent) chimichurri sauce (i.e. not flavor-full as much as onion-full). 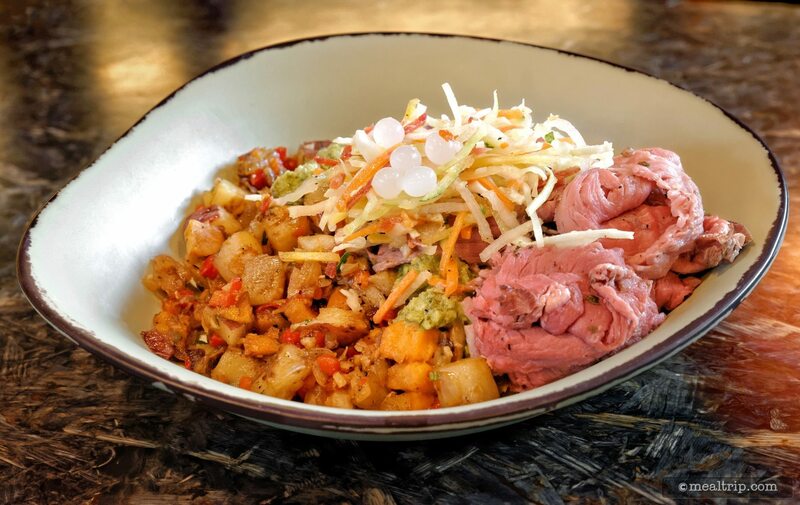 The Slow Roasted Sliced Grilled Beef… this is where Disney Culinary's biggest archival rears it's ugly head… consistency. At least that's what I hope what's going on because the only other option here is, that everyone is getting the same beef that I received, and that wouldn't be a good thing. For starters, the beef is $1.50 more than the chicken or tofu options, and there appears to be less of it, volume-wise. Beef however, is a premium protein, so that's not uncommon. The beef that I received did have a decent grilled flavor about it, and it is served pink... pink enough to get a "this item contains undercooked ingredients" warning on the menu boards. Depending on how you like your beef, that may be a good thing, or a bad thing. There was a fair amount of fat and grizzle in the portion I received, which is too bad, because there wasn't much beef there to begin with. What I found to be a little unusual here is, that if you're going to put "sliced" in the actual description of the thing… it should be sliced correctly. There's only two ways about slicing beef, you go with the grain, or against the grain. Going with the grain is easier for the slicer. Going against the grain requires a sharper knife, but is much better for the consumer. A tough piece of meat will only get tougher if you cut with the grain. The beef in my bowl was haphazardly cut (or pulled with a chipper-shredder) more with the grain than not. There wasn't a single piece that didn't end up as a giant never-ending wad of meat-in-your-mouth after you've chewed through everything else. That… is not good. The flavor of the slow roasted beef was quite good, as was everything else in the bowl. 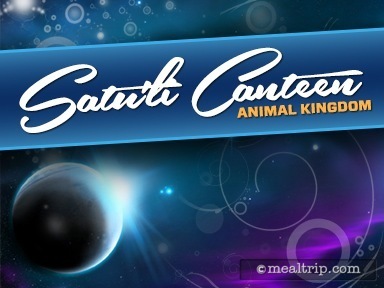 It was so good, that I'm not actually turned away from Satu'li… I just won't be ordering the beef again. That leaves me with 36 other possible combinations to try! 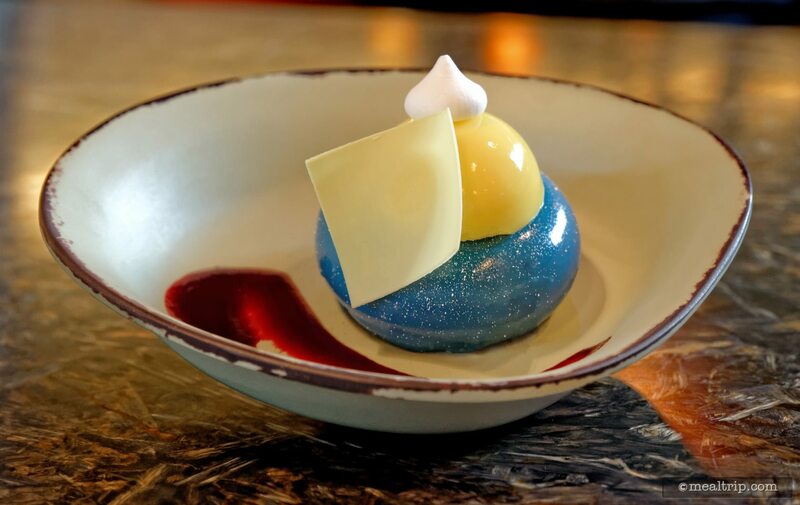 For dessert, I selected the "Food Coloring Oblivion", no… that can't be right… the "Blueberry Cream Cheese Mousse". Honestly, after the strong Chimichurri Sauce in the build-a-bowl, the delicate flavors in this one must have been hard to detect, because it seemed to be more about a creamy texture, than actual flavor. Most of the flavor here was coming from the red berry coulis at the bottom of the bowl than anyplace else. Again though, it was creamy, served cold, and very pretty. I'll have to try the chocolate one next before deciding which of the two I like best. The staff here was great, offering to take tray and even plates away when finished. The area was quite clean and everyone seemed to be staying on top of things. 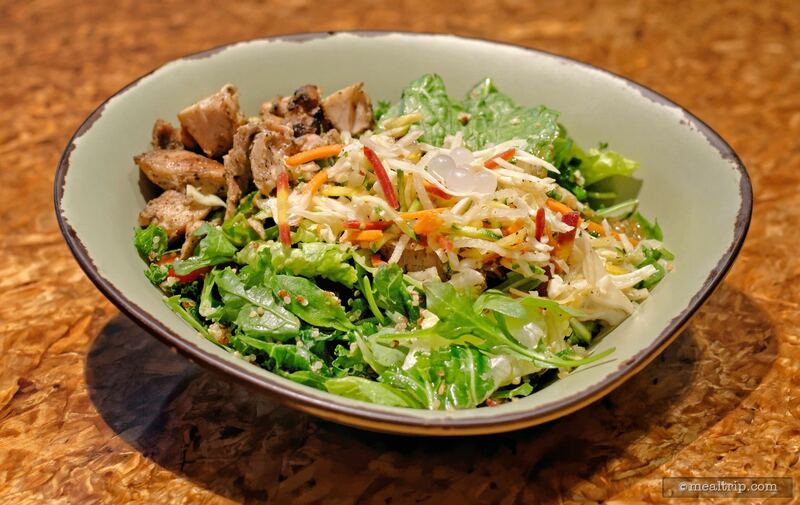 I should take a quick jog back to the gentleman that took my order at the register as well… I did grill him a bit about the options in the build your own bowl, and it did sound like he actually had tried everything, and answered all of my questions. So if you want to know something about one or more of the components, they can help describe what everything is. At the end of the day, I enjoyed my meal at Satu'li enough to want to go back again and try some of the other things on the menu. It's easy to forget that this is supposed to be "counter service" food. When keeping that in mind... they faired better than my prose might suggest. I'd say if you're in the area and are ready for a meal, it's a great option (if you can find a seat, we're hearing it's quite packed at peak dining times). Just maybe stay away from the beef unless you're okay with a good bit of chewing. CLICK HERE to view all 26 images in our photo gallery.